For your Cedar Lawn Care questions call Tes 737-932-5030. TI Tips & Notes: Use this product with the fogger! Entirely different molecular defense!! Good, Better - BEST!!! Cedar Lawn Care in 1 gallon savings! Tes purchased this in bulk to spread over the 5 acres of parks 2 x during the summer months. If you're interested in bulk for your property give Tes a call 737-932-5030. There is no reason to treat your pet at home if you treat the real problem! 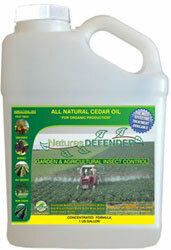 Spray your lawn with Natures Defender lawn & garden treatment! Our products perform three critical functions for treating insects in your environment. • It treats for the existing adult insect population in your lawn. • It then treats the next & largest generation of insect concerns, the eggs and larvae which interrupts the egg layer cycle. • Finally it creates a barrier of re-entry repelling/deterring insects trying to migrate from other areas outside the perimeter back into your area of control. Perpetual soil borne insect egg layers are immediately controlled because of this barrier, if the adults won’t enter the treated area, then they can’t or won’t lay any eggs. This barrier results in the ultimate non-toxic solution to treat the insect populations in areas of concern. It is EPA EXEMPT from federal registration (25b product) 85% cedar oil 15% ethyl lactate. It poses least harm to the environment, pets, farm animals, water ways, soil, farms, crops, expecting mothers and their unborn child or infants and children. PCO Choice technology provides a high level of arthropod and other insect treatment while its residual subsequently acts as a repellent. PCO Choice is a water soluble compound formulated using organic inerts that promote micron size VMD (droplets) beneficial for use in typical PCO insect treatment methods such as compression or pressure spray delivery. The chemical free solution will not stain. Egg-layer cycles are further interrupted by pheromone interference with the insect’s octopamine neuro receptors, and the next generation of arthropod is thereby treated. The formulation will not separate. Grub worm treatments: You need to saturate this area to penetrate deep into the soil. 20 gallon Hose end sprayer--- Mix 8oz. in cup (your first application) 6 oz. thereafter, fill remaining cup with water, makes 20 gallons of out-door insect treatment. 1 application covers approximately 4000-5000sq. ft. 1 Quart is enough for 5 applications 1 Gallon is enough for 21 applications Pump up sprayers---Mix 4 ounces of concentrate into one gallon of water. Stir well and spray about an hour before sundown. FOR SCORPION, MOSQUITO, FLEA, TICK and SNAKE CONTROL inside and outside premises Natures Defender PCO Choice is a Chemical Free Solution specially created for Pre or Post treatment of insect infestations. It is formulated at the highest Cedar Oil concentration levels possible for use by EXTERMINATORS and PROFESSIONAL PCO's. It can be applied with hose end, trigger, compression and pressure applicators. It is designed for immediate insect control results of inside and outside treatments for Residential, Commercial, Industrial, Governmental, Equine and Dairy entities. It is effective for control of Mosquito, Flea, Fly, Chigger, No-See-Um, Mite, Bed Bug, Japanese Beetle, Scorpion, Carpet Beetle, Ant, Mole Cricket and numerous other Non-Beneficial Insects. Natures Defender PCO CHOICE is also effective in control of GRUBS when applied on turf areas experiencing grub infestations that often result in damage to the sod. It can also be used in Misting and Irrigation Systems. Numerous concentrations of Natures Defender Natures Defender PCO CHOICE for various SNAKE and insect conditions can be formulated by the Pest Control Operator from the schedule provided with the container. The product is considered Safe to Children and Pets and has no effect on beneficial insects such as Lady Bugs, Butterflies and amphibians such as Frogs and Toads. It is classified as a Minimum Risk Pesticide by the EPA. NO APPLICATORS LICENSE REQUIRED. Normal safety precautions should be practiced when using this product. Natures Defender PCO Choice is sold in quart and gallon containers. PCO CHOICE has been formulated for OUTSIDE use. however for poultry, equine and warehouse applications it may be used effectively as a natural organic insect repellent INDOORS (Please call for more detailed information). PCO Choice is a Chemical Free Cedar Oil Solution specially created for Pre or Post treatment of insect infestations. It is formulated at the highest Cedar Oil concentration levels possible for use by Professional Lawn Care Companies, Exterminators and Pest Control Operators. Performs best when applied with a hose end applicator or high volume water delivery systems. It can also be applied with trigger, compression and pressure sprayer applications. It is designed for immediate insect control results when used for OUTSIDE treatments of Residential, Commercial, Industrial, Governmental, Equine and Dairy entities. It is effective for control of Mosquito, Flea, Tick, Fly, Chigger, No-See-Um, Mite, Moth's, Bed Bug, Japanese Beetles, Scorpion, Carpet Beetles, Ants, Mole Crickets,Termites, Box Elder Bugs, Silver Fish, Roaches, Palmetto Bugs, Lice and numerous other Non-Beneficial Insects. PCO CHOICE provides the ultimate in control of GRUBS when applied to turf areas such as sod farms or golf courses experiencing subterranean infestations resulting in damage to the sod. The Cedar Oil and Ethyl Lactate formulation dissolves the insect egg and larvae eliminating the Next Generation of arthropod, while the aromas of Cedar create a barrier of entry making the treated area off limits to any flying or crawling pest. EXCELLENT AS A SCORPION AND SNAKE REPELLENT. This product can also be used in Misting and Irrigation Systems. Numerous concentrations of PCO CHOICE for various insect conditions can be formulated by the user of PCO Choice from the schedule provided with the container. However, The concentration could be diluted as follows: hand held or back pack sprayer (2 ounces PCO to 1 gallon water) 20 gallon Hose end sprayer (8 ounces PCO fill rest of bottle, gives user 20 gallons of ready-to-use spray) Misting Machines (1 quart PCO to 55 gallons of water) Truck mounted sprayers (1 gallon PCO to 200 gallons of water) Fowl industry (6 1/2 ounces PCO to 1 gallon water) The product is considered SAFE TO CHILDREN AND PETS and has no effect on beneficial insects such as Lady Bugs, Butterflies and amphibians such as Frogs and Toads. It is classified as a Minimum Risk Pesticide by the EPA. NO APPLICATORS LICENSE REQUIRED. Normal safety precautions should be practiced when using this product. 20 pounds of red cedar heartwood granules from the center of choice and aged red cedar trees common only to East Central Texas. These granules contain high concentrates of aromatic red cedar oil which is offensive to insects. The long lasting aroma will repel fleas, ticks, mosquitos, roaches, scorpions, flies, no-see-ums and venomous snakes. It has no effect on beneficial insects such as butterflies and pollinating bees. Sprinkle in areas you desire insect free or where you wish to enjoy the pleasant and exciting aroma of red cedar. Excellent for inside atriums and planter boxes. Can be used to rejuvenate or simulate cedar closets or cedar chests. An open container in your pantry will deter cereal beetles and other pests from harboring in foodstuffs. A little bit of these granules will go a long way. A Landscaper & Gardner's dream. Spread in yards to repel insects. Coverage: 5000 sf. of lawn 20 pounds of red cedar heartwood granules from the center of choice and aged red cedar trees common only to East Central Texas. These granules contain high concentrates of aromatic red cedar oil which is offensive to insects. The long lasting aroma will repel fleas, ticks, mosquitos, roaches, scorpions, flies, no-see-ums and venomous snakes. It has no effect on beneficial insects such as butterflies and pollinating bees. Sprinkle in areas you desire insect free or where you wish to enjoy the pleasant and exciting aroma of red cedar. Excellent for inside atriums and planter boxes. Can be used to rejuvenate or simulate cedar closets or cedar chests. An open container in your pantry will deter cereal beetles and other pests from harboring in foodstuffs. A little bit of these granules will go a long way. Packaged in a 20 pound poly bag for extended shelf life. Lawn Areas: Pour bag contents into a fertilizer spreader. Open to highest setting of the spreader. Broadcast the Cedar granular over the entire area with one pass. If you do not have a fertilizer spreader, then hand toss method is also acceptable. BEDDING: As an insect repellant, reduce mildew growth, eliminate bacteria growth and use to control the odors in your barns then simply spread it directly on top of your existing wood bedding Pour the cedar granular evenly over their current bedding to cover the entire area. This makes a great repellent for all types of farm animals and fowl. Use approx. 20lbs. per 5000 sq. ft. of stall coverage. Evenly apply a 2 foot wide band next to the barn foundation to ward off insects from ever entering your barn. FLOWERBED AREAS: Hand Toss on top of existing mulch beds. You can apply over any type of mulch material such as pine needles, colored mulches, pine mulch, cypress mulch. After the mulch is to your satisfaction, simply hand tosses the Cedar granular through out the beds. The main purpose of applying Cedar granular under shrubs is to make mosquitoes seek your neighbor’s bushes and shrubs to hide out. 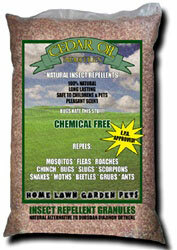 With the cedar aroma present in your flowerbeds, mosquitoes will stop hanging out in your yard. 2X the amount of cedar aroma in the environment. MAINTENANCE APPLICATION: apply 1X over the lawn and flowerbed areas, for best results apply every 60 days to maintain a high cedar aroma in the lawn areas. DOUBLE APPLICATION: any active insect infestations such as ants, fleas, grubs,You cannot over apply the product. The more products you apply, the stronger the concentration of the cedar aroma will become. • Using a spreader designed for application of granular materials, uniformly apply 20 lbs over 5000 sq ft dependent on maintence schedule. For first application or for snake control you may want to put an additional 20 lb bag depending on your level of infestation. • Use 10 lb of product for a 500 sq ft. area for mature gardensHome Foundation• Evenly apply a 2 foot wide band next to the home foundation to ward off insects from ever entering your home like termites and scorpions. Use approx. 10 lb for each 100 linear ft.
A bag of Cedar granular is 20 pounds. You can get 5000 sq ft of coverage per bag. If your yard is of average size approx. 5,000 to 6,000 sq. ft. then you would need 1 or 2 20 pound bags. If you are using Cedar granular for the first time, we recommend that you double your concentration to get your insect population under control. If you are using Cedar granular to control snakes, then we recommend a double application on the perimeter of your property. After you have made the double perimeter application, you can drop down to one application based upon the situation as stated above.